Ace Attorney Investigations: Miles Edgeworth, known in Japan as Gyakuten Kenji (逆転検事, lit. "Turnabout Prosecutor") is an adventure video game for the Nintendo DS handheld game console by Capcom. It is a spin-off of the Ace Attorney video game series. This game is a standard "point and click" adventure, with the player controlling Edgeworth's movements and what he interacts with. For each case, the goal is to collect evidence to determine who the perpetrator is, how the crime was committed and their motive. This is presented as a combination of a third-person view showing the characters at the crime scene and through animated close-up images of the characters, annotated by text dialog. In some cases, still images are used to highlight dramatic scenes." 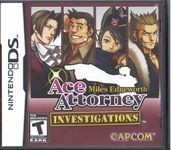 Source: Wikipedia, "Ace_Attorney_Investigations:_Miles_Edgeworth," available under the CC-BY-SA License.